Georgetown is the county seat of Scott County, Kentucky. 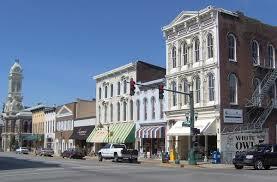 It is the 7th-largest city by population in the U.S. state of Kentucky. It was originally called Lebanon when founded by Rev. Elijah Craig and was renamed in 1790 in honor of President George Washington. It is the home of Georgetown College, a private liberal arts college. Georgetown is part of the Lexington-Fayette, KY Metropolitan Area. The city's growth began in the mid-1980s, when Toyota built Toyota Motor Manufacturing Kentucky, its first wholly owned United States plant, in the city. The plant, which currently builds the Camry, Camry Hybrid, Venza, Avalon, and Lexus ES automobiles,opened in 1988. It is the largest building in terms of acres covered under one building in the United States, with over 200 acres occupied. The city previously served as the training camp for the NFL's Cincinnati Bengals.